Kappa biriyani aka ellum kappayum is a mix of Kappa (tapioca) and beef (with bones). Some people call it kappayum erachiyum also. It is a food item common in middle Kerala mostly between the Christians and Muslims of Kottayam and Idukki. This is also a popular item in roadside shops (Thattukadas / Streetfood) in Kerala. In some places of Kerala this kappa & beef mixture is also known as Asiad (ഏഷ്യാഡ്). This is an easy to prepare one with less requirements. It will be better if you use the ribs of the beef for the preparation. Slice the tapioca’s into small pieces of roughly 2cm length and width and clean it well under running water. Add salt and turmeric powder and cook it in water until kappa become soft in a pressure cooker. (Tapioca’s should be fully immersed in water). Once it is fully cooked, drain off the water completely and keep it aside. Grind together shallots, garlic, green chilies together. Heat the oil in a pan and add the garlic paste to it then add the sliced onions,curry leaves to it and saute well. Cut the beef with bones into small pieces same size as that of tapioca, marinate it with grinded garlic, ginger , chilly powder, coriander, turmeric powder, pepper powder, garam masala, salt and keep it aside. Cook it in a pressure cooker until done. (Three whistles will be enough). Move all the contents to a big vessel and mix together cooked tapioca and the beef in a big vessel. Give low flame to the vessel to keep the mix hot while mixing. Heat oil in a pan, Splutter mustard seeds and fry curry leaf, shallots & dried chilli for seasoning. Add this seasoning mix to the tapioca meat mix. Don’t forget to serve it hot! Try our other tapioca recipes too. 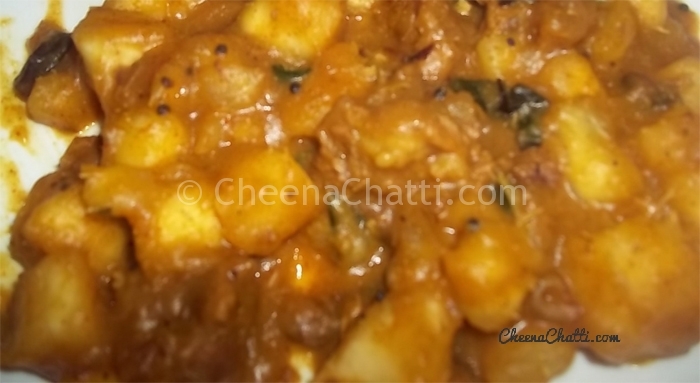 How to make tapioca chips / Kappa Varuthath at home. This entry was added on March 19th, 2013 by Renoos in Non Veg and tagged with tapioca recipe, tapioca beef mix, indian kappa beef recipe, kappabiriyani recipe, kappa beef, kerala kappa biriyani, kottyam kappa biriyani recipe, non vegetarian, how to make tasty kappabiriyani. Last revised on March 30th, 2018.
can we make a vegetarian version of kappa biriyani?